Last year, my husband Eric has decided to issue me a design challenge each month to get me out of my comfort zone and to help clear out my bead stash... and we're continuing the Honey Do List for 2017! I know that I'm not the only one who loves a good design challenge, so I'm hoping folks will continue to play along! I had hoped for some more color in my shot for this month, but "spring" in Minnesota is still much later than southern climes. 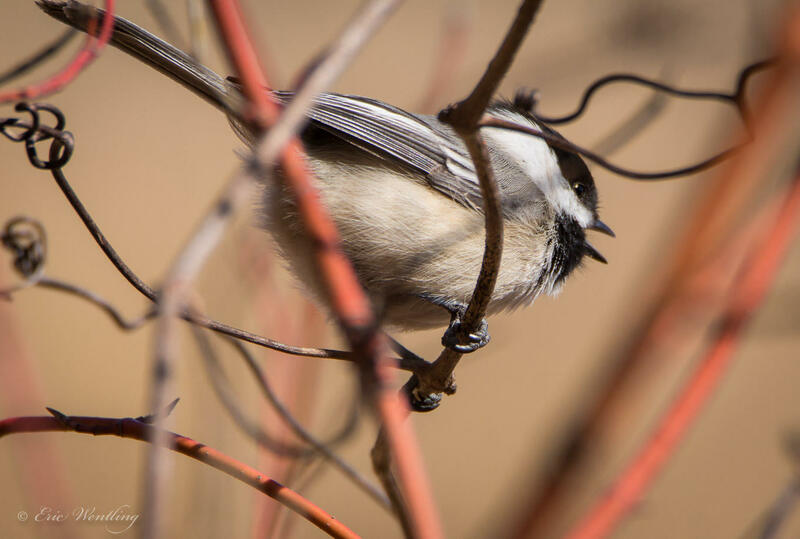 So I worked a little red into this action shot of a cute Chickadee! The birds are back, and next month should be much more vibrant with the colors of spring. I have a special place in my heart for chickadees... they were one of my Mema's favorite birds. I spent a ton of time at her house as a child since she lived two houses up the street from us. She had two window sills that she would always put birdseed out on (it was a brick house with a decent sized ledge) so she could watch all the birds from her bedroom. I love that our backyard feeders are regularly frequented by chickadees. For my first design, I finally used a pendant by Earthenwood Studio that I've had in my stash since very early on in my beading life. 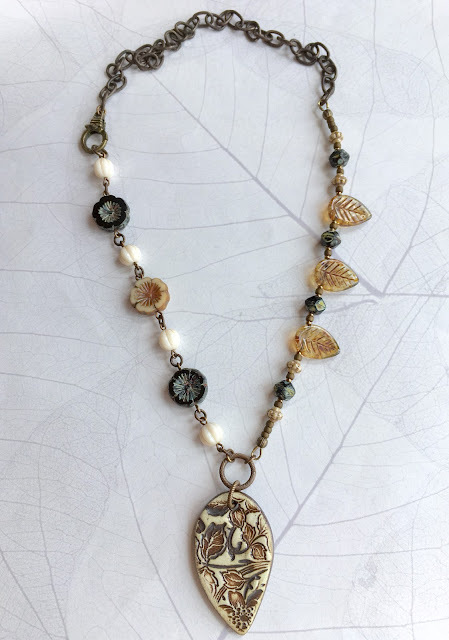 While there's no bird to be found in this necklace, the cream and dark brown viney floral reminded me of the plants that Eric's little chickadee is perched amongst. True story, I've had one of the black Czech glass flowers stored alongside this pendant for a couple of years now, waiting for the right time to explore a design. Well, that time is now! 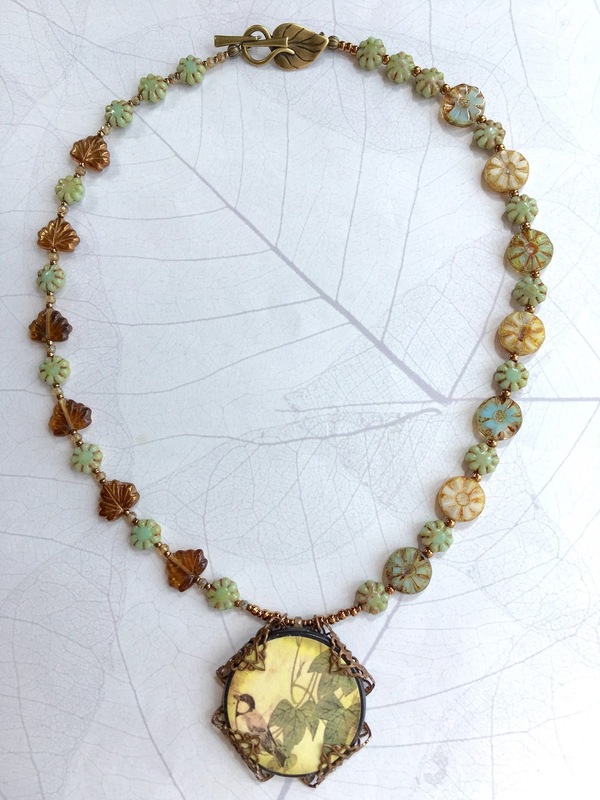 I added some other flower and leaf beads in earth tones as well as some smaller glass beads for an asymmetrical design. 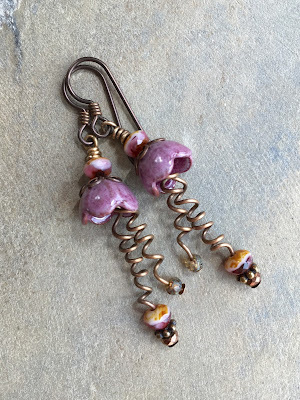 The strung side came out a little bit longer than the other so I chose to even things out by having the clasp connect to the end of the side with the bead links. Lastly, I wanted to play with the idea of the vines a little bit more. I revisited the idea of having vine-like tendrils coming out of enameled bead caps from C-Koop Beads for fun earrings. I really need to just sit down and make more of these in a variety of colors... I keep forgetting about them! These piec s are wonderful! I love the way the leaves in the first piece echo the shape and color of the pendant, and how you used the filigree to frame the pendant in the second necklace. The earrings are adorable. I second necklace looks antique, like something found in a forgotten jewelry box. All of these pieces are beautiful. I love your little tendrils! I was thinking of about your use of those before the other day when I thought they'd be cute in a project (that I've already forgotten!) I agree that the second necklace looks like an heirloom. Beautiful choices to represent the challenge! Simply lovely! I don't seem to be able to pick a favorite. ...And I know I'm a little late to the party, but I'm glad to finally be able to post my creation, too. Thanks so much for letting me play along! The asymmetry of the first necklace is very artsy. Both pendants are gorgeous and I really like the filigree wrapping on the second! The tendrils are perfect and such a great idea to try!